Mountain bike racing Hall of Famer Nat Ross rides a fat tire bike during a demo day made possible by Breck Bike Guide at the Frisco Adventure Park Tuesday, Jan. 30, in Frisco. The demo day and wrap party in Frisco capped a weekend of events at the annual winter Outdoor Retailer show, which was hosted late last week at the Denver Convention Center. 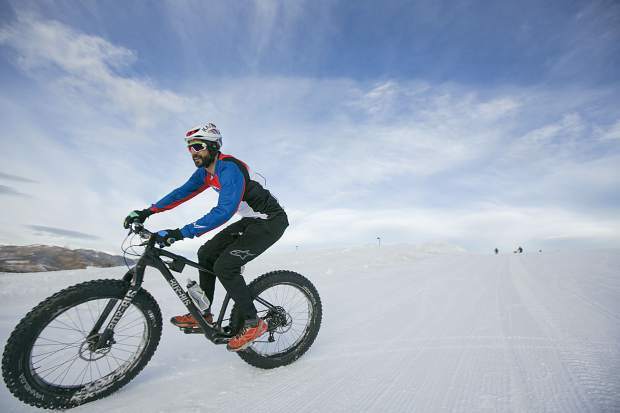 RJ McHenry tests a fat tire bike during a demo day made possible by Breck Bike Guide at the Frisco Adventure Park Tuesday, Jan. 30, in Frisco. The demo day and wrap party in Frisco capped a weekend of events at the annual winter Outdoor Retailer show, which was hosted late last week at the Denver Convention Center. Ruth Meade tests out a fat bike from Breck Bike Guides during a Tuesday demo at the Frisco Adventure Park. 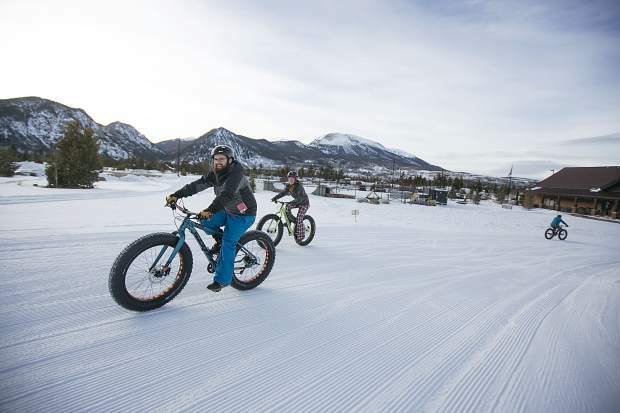 Representatives of Breck Bike Guides help people get comfortable on fat bikes while offering free demos Tuesday at the Frisco Adventure Park. 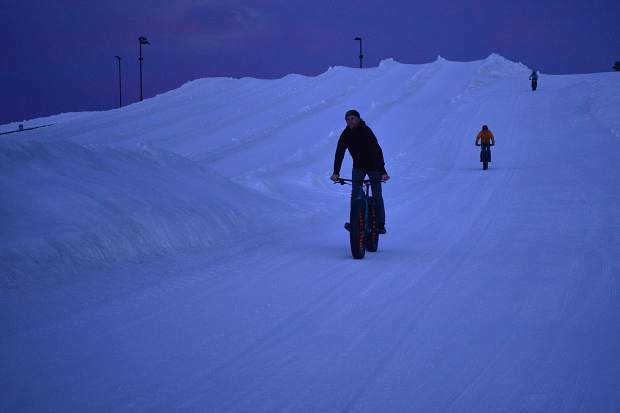 Scott Pohlman, Eric Bensen and Ruth Meade climb a hill at Frisco Adventure Park while testing out some fat bikes under Tuesday night’s full moon. The trio all said they impressed with how well the bikes handled on the pack snow. Followed by Scott Pohlman and Ruth Meade, Eric Bensen leads the way coming down a hill at Frisco Adventure Park while testing out some fat bikes Tuesday. RJ McHenry, front, and Jamie Pestien test a fat tire bikes during a demo day made possible by Breck Bike Guide at the Frisco Adventure Park Tuesday, Jan. 30, in Frisco. The demo day and wrap party in Frisco capped a weekend of events at the annual winter Outdoor Retailer show, which was hosted late last week at the Denver Convention Center. 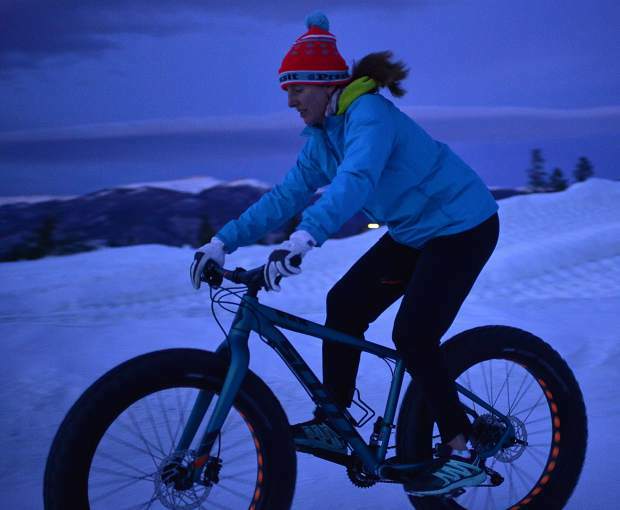 Under Tuesday night’s moon, Breck Bike Guides offered free fat bike rides, along with some live music, a winter-biking talk by Nat Ross, food and beer. 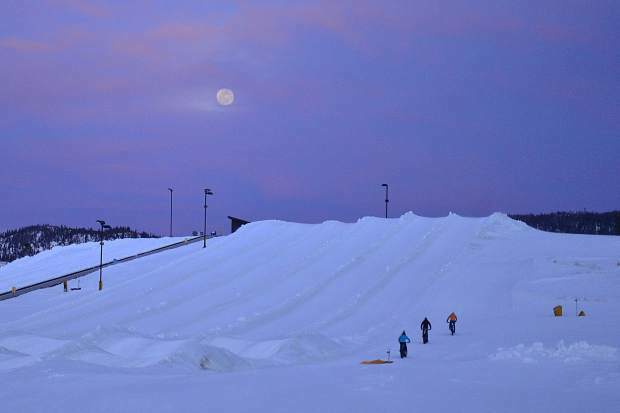 The Full Moon Fat Bike Fête at the Frisco Adventure Park was a way for locals to celebrate what has been a great early season of fat biking and a chance for people who attended the Outdoor Retailer + Snow Show in Colorado to gather for their final day in the mountains. 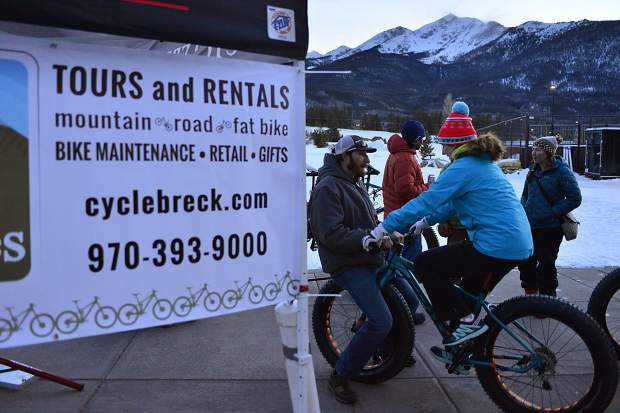 The owner of the Breckenridge Bike Guides business, Nick Truitt, estimated Tuesday night that they had done at least 30-40 demos with a number of first-timers taking spins. As the event was winding down, Truitt said many of the people trying out the bikes for the first time displayed similar reactions. The bikes are at their best on packed snow, he said, and it’s been great riding so far this season. For someone who wants to get into fat biking, Truitt recommended testing a number of bikes out before making a purchase. Fit is important, he said, and there’s a question about how much suspension someone wants built into the bike. Truitt said someone can score a fat bike at a store like Walmart for a couple hundred dollars, but that person often ends up back in his store about a year later looking to upgrade. Instead, he suggested spending the extra money to get “a good fat bike,” which typically starts at about $1,100. Anywhere between $1,000-$2,000 will get someone a pretty nice bike, he said, adding that the fancier fat bikes can climb up to $10,000. “But that’s if you’re going to get real serious and race it or something,” he said. 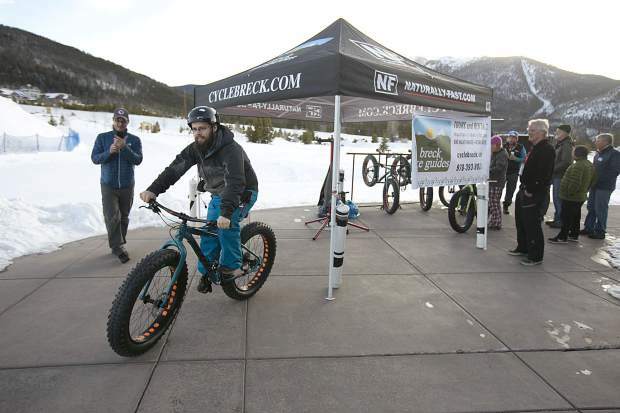 Additionally, Frisco will also be hosting a fat bike event with the 2nd annual Frisco Freeze Bike Race on Feb. 10 at the Frisco Nordic Center. It’s a rare chance to winter bike at the Frisco Nordic Center, as the center is otherwise not open to winter biking, according to the town. For the race, there will be six categories for awards, and awards will be given to the top three racers in each category. Registration fees range from $20-$35. For more, FriscoRecreation.com.